This week we feature three authors whose work covers a broad range of topics from humor and family relationships to fiction. Check out their work. You won’t be disappointed! 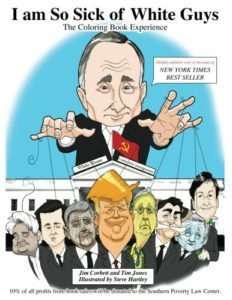 The country’s political turmoil inspired author Tim Jones to join forces with Jim Corbett and illustrator Steve Hartley to create I Am So Sick of White Guys, a coloring book which pokes fun at the political environment in which we are forced to live.